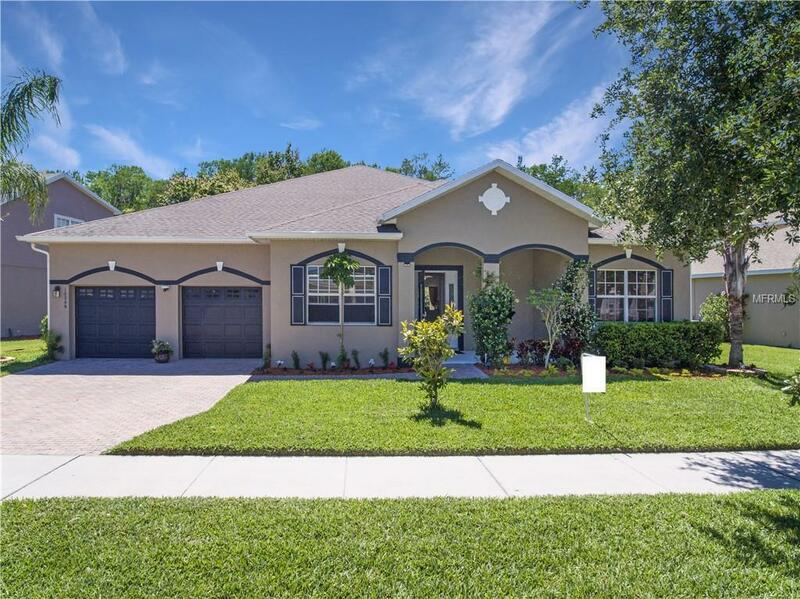 AMAZING MEDICAL CITY AREA HOME ON CONSERVATION! Come home to this spacious, open, & MOVE IN READY MASTERPIECEhighlighted w/OFFICE & TANDEM 3 CAR GARAGE on over 1/5 acre. Your centrally located kitchen is highlighted w/42" Cherry cabinets, 18" Tile, granite countertops, NEW stainless steel refrigerator & microwave, breakfast bar & full complement of appliances. The spacious owner's retreat features ceiling fan, tray ceilings, huge walk in closet, dual cultured marble sinks, garden tub, & tiled shower. Elevated 10 1/2 ft ceilings, wood laminate floors, designer light fixtures, decorative pillars, arches, wall nooks, blinds, French door, & recess lighting provide the touches of elegance to this beautifully laid out open & split floor plan! This home is LOADED w/storage space & deluxe closets, plus decorative ceiling fans in every room. Walk out a wall of sliding glass doors to enjoy outdoor Florida living under your huge covered lanai with fire pit and a tranquil conservation view! Have a peace of mind knowing this home features NEWER ROOF, ENERGY EFFICIENT WINDOWS, EXTERIOR & INTERIOR PAINT, gutters, insulated garage, security system, zoned for GREAT Schools, & protected w/1 YEAR HOME WARRANTY! This community is loaded w/amenities to include tennis courts, basketball court, sand volleyball pit, fishing pier, walking trail, playground, multiple parks, and sailable lake. This community perfectly positioned near the Lake Nona Medical City, USTA, & Orlando International Airport w/quick access to SR 528 & 417. Additional Lease Restrictions Long Term Leasing Only. Listing provided courtesy of Keller Williams Advantage Iii Realty.